2015 has been a great year for movies. From SICARIO and SPECTRE to THE MARTIAN and STEVE JOBS, it takes a special kind of film to stand out from the crowd. One film that just does that is HE NAMED ME MALALA. HE NAMED ME MALALA tells the true story of Malala Yousafzai, a Pakistani schoolgirl who was targeted by the Taliban when returning home on the school bus. The 88 minute documentary follows her inspirational journey and courageous fight for equality, including her speech to the United Nations. Learn about how one child, one teacher, one pen, one book and one girl’s vision for justice can really change the world. What makes HE NAMED ME MALALA so special is the way in which it is told. While the film is essentially a documentary film, parts of Malala’s and her father Ziauddin’s story are told through short animation. Designed like a child’s storybook, Animation Producer Irene Kotlarz creates innocent child-like stories, bringing the animations to life with the simplicity of the brush strokes and the depth of the colours used. Add to this a genuine and naturalistic performance by Malala and her father and you feel as though you’re at a family dinner in the heart of Birmingham. HE NAMED ME MALALA also does not follow a traditional linear process. Starting from the ending, and jumping back and forth to specific moments, the film bounces from Malala’s past life in Pakistan, to her current life in Birmingham, England. The juxtaposition of past versus present brings out the life of the story being told. 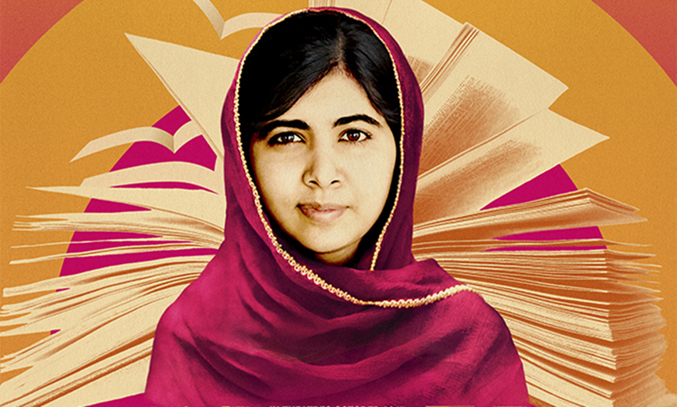 You learn more about who Malala is as a person, her journey and what she stands for. It also means you can go into the film without prior knowledge of Malala and still leave the cinema feeling inspired, emotional and intrigued to find out more. All in all, HE NAMED ME MALALA is faultless from start to finish. Young or old, everyone should see this film. It is a real eye opener and one of the best films of the year. You will not regret seeing it. HE NAMED ME MALALA is released in UK cinemas from 6 November 2015.